Let’s be honest with ourselves for a second, regardless of how much college basketball you’ve watched up to this point in the season, you don’t know which teams are going to make the Final 4, I don’t know which teams are going to make the Final Four, and neither do the experts. If you’ve been watching your share of college hoops and you don’t suffer from “Jim Caldwell syndrome” (otherwise known as the inability to have an opinion, take a stance on anything, or show any emotion) you probably have some idea about which teams you think are capable of making a run to the Final Four, and you probably have some idea of which teams you don’t trust to win four straight pressure-filled tournament games. But the only thing we know for sure right now is that at this time last season, none of the teams that would eventually go on to reach the Final Four were ranked in the top 15 in either poll. What happened last year was certainly unexpected, even for March Madness, but it’s safe to say that the tournament has been trending this way for some time. Unless you were the lone VCU alum who played the “I don’t care if we barely limped into the tournament, I’m picking us to go to the Final Four” card (isn’t it annoying when this guy wins your pool? ), the unforeseen run that VCU made last season was completely out of the blue, and although teams like UConn and Butler had talent on their side, neither one seemed capable of making too much noise in the tournament at this time a year ago either. Of course, it’s entirely possible that we were just a mind numbing Nasir Robinson 90-foot away-from-the-basket foul, one of the greatest flops in college basketball history (love the zapruder-like second angle on this video), and the selection committee overlooking an 11-loss team from the Colonial Athletic Association away from having last year’s Final Four look a lot different, but hey, that’s the tournament for you. There’s no doubt that last year’s tournament was one of the most wide open fields in recent memory, and the fact that so many NBA-caliber players decided to stick around this season figures to make things even tougher on some under-the-radar teams to make waves like Butler, VCU, and UConn did last season, but seeing as it’s about to be March, and it’s virtually impossible to say for sure how far teams will advance without looking at a bracket that doesn’t yet exist, it couldn’t hurt to highlight a few teams that are currently ranked outside the top 15 in both polls that have the best shot of making the Final 4 this season. Some of these teams might seem fairly predictable, and some of them might seem like they have no shot to even win a game in the tournament much less four, but let’s remember what we thought about teams like VCU and Butler a year ago, if we even thought anything about them at all. Seeing as the Huskies were one of the inspirations for this article, I might as well start this list off with them. 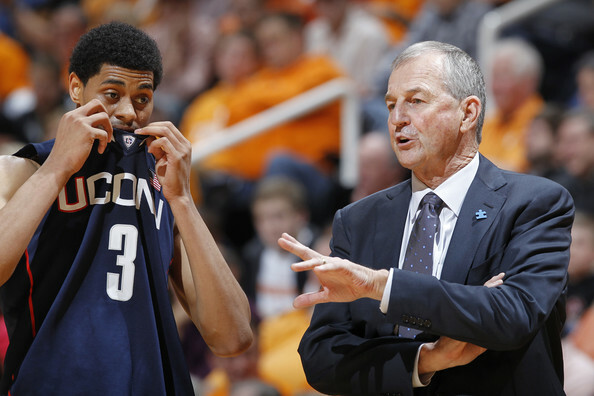 Despite the fact that they lost Kemba Walker to the NBA, plenty was expected of UConn this season, but things haven’t quite worked out the way Jeremy Lamb, Jim Calhoun, or anyone else in Storrs thought it would. Sitting with a record of 17-12 (just 7-10 in the Big East) it’s possible that UConn misses out on the tournament all together, but if they manage to make it into the field of 68 this team has the talent to make another run. There simply aren’t many players in college basketball like Jeremy Lamb, and although everyone’s expectations might have been a bit too high for the sophomore swingman coming off his brilliant play towards the end of his freshman season, he’s still capable of carrying this team on any given night against anyone in the nation. Shabazz Napier has certainly been inconsistent at best this year, but when he hit the game winning 30-foot three pointer without hesitation after shooting 1 for 6 up to that point in UConn’s overtime victory over Villanova last week, he showed everyone that he’s capable of making game changing plays. Perhaps Andre Drummond’s 17 point, 14 rebound performance that nearly helped UConn topple Syracuse this past Saturday is a sign of what we should expect out of the talented freshman big in the coming weeks, but even if it’s not, the fact that Jim Calhoun is planning on making his return to the UConn bench at the beginning of March could be the shot in the arm this team needs to play up to their potential and stop disappointing everyone. 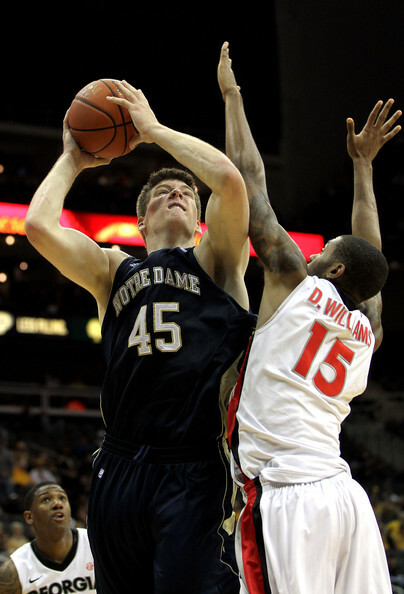 When Tim Abromaitis was lost for the season after having played just two games for the Fighting Irish, it didn’t seem like Notre Dame would be much of a factor in the Big East, but Mike Brey and Co. have survived the loss of their best player to post a 20-10 record (12-5 in the Big East) and they’re currently tied for third in the conference. They’re not going to score a lot of points, and their style of play isn’t going to win any beauty contests, but Notre Dame knows how to keep things ugly and win games. Their recent nine game winning streak in conference play, which included handing Syracuse their only loss of the season to date, showed just how effective this team can be when they’re playing games on their terms. The backcourt combination of Eric Atkins and Jerian Grant provides Notre Dame with two steady operators who are both capable of setting up teammates and also putting points on the board themselves. Jack Cooley’s rise from the guy who everyone used to confuse with Luke Harangody to a legit post presence has been exactly what this team has needed, and the streaky but deadly-when-feeling-it outside shooting of Alex Dragicevich, Scott Martin, and Pat Connaughton can win games for the Fighting Irish. Their recent losses to St. John’s and an 18-point demolishing at the hands of Georgetown have certainly taken some of the wind out of Notre Dame’s sails, but the burn offense just might be able to slow things down enough in the tournament to allow this team to make a serious run in a couple of weeks. It’s no secret that I like Florida State, but last week wasn’t very kind to the Seminoles. Losing to Duke was understandable because you knew the Blue Devils were out for blood after Michael Snaer tore their hearts out in Cameron a couple of weeks ago, but getting shelled by a Miami team that was playing without Reggie Johnson certainly leaves something to be desired. Even so, we’re talking about a veteran group that has shown they can beat elite teams (see victories over Duke and UNC this season) and the Seminoles are certainly capable of matching up with pretty much anyone on defense. Michael Snaer is quickly becoming the kind of player that this team can rely upon to lead them through hard-fought tournament games, and everyone knows that Bernard James is going to give Florida State some tough buckets around the basket while rebounding and defending as well as pretty much anyone in the country. That being said, it seems like the key to Florida State’s tournament success might hinge on how much production they get from guys like Ian Miller, Xavier Gibson, Luke Loucks, Okaro White, and Deividas Dulkys, all of whom are capable of making a major difference for this team when they’re playing well. If Snaer and James are getting consistent help from those five guys, Florida State just might be able to build off last season’s trip to the Sweet 16 and take things a little further in 2012. Mike Scott might not be the only reason why I’m including Virginia on this list, but he’s certainly the biggest. We’ve seen a number of stars simply take over in the tournament, and Scott has the potential to carry the Cavaliers for a few games once the brackets come out. Players like Harrison Barnes, Tyler Zeller, and Austin Rivers have garnered more attention in the ACC, but Scott is having a great season of his own for Virginia. Averaging 17 points and 8 rebounds while shooting 57 percent from the field, Scott has been one of the least talked about stars in college basketball this season, and his versatile offensive game can create plenty of mismatches for opponents. Besides Scott, Virginia has a solid compliment of supporting players, but their defense could be the real difference maker in March. Simply put, points are hard to come by when you’re playing Virginia, and it’s gotten to the point where scoring 60 against the Cavaliers could be viewed as an accomplishment. This team can play all of the low scoring games it wants in the tournament, but Virginia is going to need Mike Scott playing at an extremely high level to make a serious run in the tournament, and he’s one of the few players in the nation who is capable of doing just that. Louisville’s been a little tough to figure out this season, but it’s hard to doubt the pieces on this team. 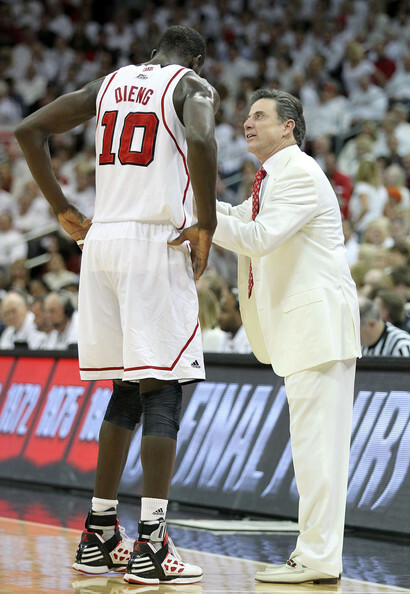 Rick Pitino has plenty of options at guard, and whether he’s leaning on veterans like Kyle Kuric, Peyton Siva, and Chris Smith to carry the load, or he’s looking for a spark from Russ Smith off the bench, Louisville has plenty of talent in their backcourt. The emergence of Russ Smith in particular has been a revelation for the Cardinals this season, and the sophomore guard is second on the team in scoring despite the fact that he’s seeing just 22 minutes of floor time per game. The flashes of brilliance that Smith has shown in relatively limited minutes this season should scare any team that Louisville will face in the tournament, and “instant offense” players that can make their presence felt in a short period of time have made a habit of shining in the tournament in years past. The Cardinals aren’t quite as deep under the basket, but the combination of Gorgui Dieng and Chane Behanan gives this team some nice balance and solid production out of their post players. The Cardinals don’t have a ton of impressive wins this season, but if it’s any consolation at all, their four losses to Georgetown, Kentucky, Notre Dame, and Syracuse came by a combined 12 points, showing that they have more than enough talent to trade blows with teams that will be receiving some very high seeds on Selection Sunday. Very quietly, the three-headed backcourt monster of Ramone Moore, Khalif Wyatt, and Juan Fernandez has Temple sitting atop the A-10, and has them ranked in the top 25 in both polls. All three players shoot over 38 percent from behind the arc and none of them are shy about hoisting up a couple of long range bombs whenever they’re open. Both Moore and Wyatt possess the ability to carry this team for long stretches at a time on the offensive end of the floor, and their consistency (of the 55 games the duo has played this season, both guys have failed to reach double figures just four combined times) is something that should serve the Owls well in March. Wyatt’s transformation from supersub last season to one of the team’s go-to scorers was on display when Temple defeated Duke 78-73 in early January as the junior guard led the way with 22 points, while also notching five steals. Micheal Eric looked poised for a breakout senior season, and even though the 6’11’’ post presence missed 13 games during the middle of the season due to a knee injury, he returned to the starting lineup in early February and has been averaging 11.6 rebounds to go along with 2.4 blocks in his last five games. Although I adhere strictly to the rule that you should never trust anyone with two first names, Eric seems to be fully recovered from his knee injury, and he could be a difference maker for Temple in the tournament. I won’t bore you with the cliché about guard play coming up big in March (I guess I just did), but when you have three guys as experienced and talented as Fernandez, Wyatt, and Moore leading the way, and someone like Eric under the basket, the Owls have the potential to ride a hot wave of shooting a long way. At the same time, the Hoosiers other two road losses came against much less impressive opponents (Nebraska and Iowa), but I think we should recognize how few teams in the nation would be able to go into East Lansing, Columbus, Madison, or Ann Arbor and come away with victories. The question everyone’s trying to figure out at this point is whether we’re going to see the team that has been downright scary at home, or the one that’s struggled on the road. It’s anyone’s guess at this point, but the Hoosiers have flashed the potential to go toe-to-toe with anyone in the country. The thing about this team is that they basically have everything necessary to make a run in the tournament. Dominant big man? They’ve got Cody Zeller. Energy wing player/defender? They’ve got Victor Oladipo. Sneaky lights out shooter people often forget about? They’ve got Jordan Hulls. Matchup problem who is capable of carrying this team and hitting big shots? 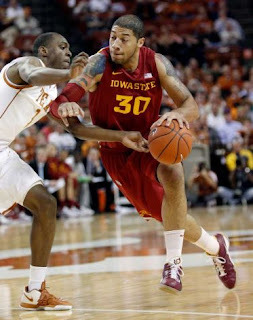 They’ve got Christian Watford. Supporting players who can step up? They’ve got Will Sheehey and Verdell Jones III. With a roster like that, Indiana is definitely a threat to make a serious run in the tournament this season, despite the fact that they’ll have to do it away from home. Entering the month of February, Creighton was sporting a record of 20-2, steadily climbing up the polls, and looking like a mid-major who could crash the tournament. Then they lost their next two games to middle of the pack Missouri Valley teams Northern Iowa and Evansville, and followed that up by losing to Wichita State at home by 21, while Doug McDermott and his father reenacted the famous “you gonna cry?” scene from The Great Santini during a timeout. After those three losses, the Bluejays swiftly fell out of the top 25, and although it looked like they might enter a downward spiral that coincided with one of the stranger player-coach relationships in the country, the Bluejays rebounded to win their last four games (albeit in close fashion), while Doug and Greg McDermott seem to have patched things up. Father-son relationships aside, McDermott is having an amazing sophomore season for Creighton, and the offensive efficiency and consistency that once had him as a candidate for Player of the Year (before everyone forgot that the discussion around that award doesn’t necessarily have to be limited to just two players) makes the Bluejays a threat once the tournament starts. With McDermott powering their attack, Creighton sports the 8th highest scoring offense in the nation and they shoot an astonishing 50.8 percent from the field as a team, while connecting on close to 43 percent of their long distance attempts. It’s not always the mid-majors that hover around the top 25 all season who end up making everyone’s bracket a mess in March, but why not Creighton? I don’t know if either Saint Mary’s or Gonzaga truly deserves their own write up, so they’ll have to share one. In Saint Mary’s you’re looking at a solid team with a great point guard that doesn’t really have a signature win (although beating Gonzaga by 21 is pretty impressive). Matthew Dellavedova was just crowned the WCC Player of the Year, and Rob Jones has been able to average 15 points and close to 11 rebounds per game despite standing just 6’6’’, which almost defies the laws of physics. I have to imagine that Jones will have a tougher time putting up those numbers against bigger players in the tournament, but he’s definitely a talented guy this team will need come March. Gonzaga on the other hand has notched some more impressive wins this season, and ever since I saw Kevin Pangos score 33 points and hit nine three-pointers in his second collegiate game back in November, I’ve loved his potential to shoot this team to victory over almost anyone. Gary Bell Jr. hasn’t made quite the splash in the Bulldogs backcourt that Pangos has during his freshman season, but he’s done a great job chipping in with 10 points per game, and his 48 percent shooting clip from behind the arc adds another deadly long distance shooter to Gonzaga's roster. Closer to the basket, Elias Harris and Robert Sacre take care of the dirty work, although I still find it hard to believe that a seven-footer with the physical tools of Sacre is only averaging 6.4 rebounds and 1.4 blocks in his senior season. Neither of these teams has the luxury of sneaking up on anyone once the tournament starts (those days are long gone), but they have enough talent and outside shooters that they might be able to get hot and string together four wins in the tournament. I’m won’t lie, for those of us that live on the east coast and have a job that requires them to wake up before 8 am, most of these teams play too late to really watch the majority of their games, so between that and the fact that neither UNLV, San Diego State, or New Mexico has established their dominance in the Mountain West, I’m going with the conference as a whole (yes, it’s a cop out, let’s move on). UNLV notched one of the best wins of the early college basketball season when they knocked off North Carolina in late November, but more recently they’ve dropped games to Wyoming, TCU, and New Mexico, so go figure. Mike Moser and Chance Stanback, a couple of UCLA transfers, give the Runnin’ Rebels two versatile swingmen that can dominate games when they’re firing on all cylinders. UNLV has had some trouble on the road during the last couple of weeks, but of all the teams in the Mountain West they might have the best chance to make a big run depending on how the brackets shake out. New Mexico didn’t play the toughest out of conference schedule, but after whiffing on their first two opportunities to notch big wins over either San Diego State or UNLV, they avenged both of those losses during the last few weeks and really confused anyone who was trying to make heads or tails of this conference. Of course, on the heels of beating SDSU and UNLV, New Mexico has promptly lost their next two games against at Colorado State and at TCU, so good luck trying to make sense of Lobos. San Diego State’s guard heavy approach has Steve Fisher looking at yet another trip to the tournament (how is it possible that this guy coached the Fab 5? ), and with guys like Jamaal Franklin, Chase Tapley, Xavier Thames, and James Rahon leading the way, this team hasn’t fallen off too much after the departures of Kawhi Leonard and Malcolm Thomas. Franklin in particular has really started to hit his stride during the second half of the season after he was inserted into the starting lineup, and his most recent 31-point performance against Colorado State shows the kind of explosive scoring he’s capable of. After the top three in the Mountain West, maybe teams like TCU and Colorado State can sneak into the field of 68 as well, where they just might be able to pull off a VCU-esque run in March. but not a vandy? they blew marquette out of their own gym, played ky tough TWICE and just beat top 15 florida. no chance they can do much in tourney? Saint Mary, San Diego? not agreeing. These are teams hyped by ESPN to increase viewership. Vandy was included, they're sandwiched between Iona and Creighton. And I basically mirrored your argument about them playing Kentucky tough twice and just knocking off Florida as a reason why this team could make a deep tourney run, so I guess we're in agreement. As for Saint Mary's and San Diego, I'm not sold on them either (which is why I didn't give them their own write up and questioned how effective one of Saint Mary's best players would be come tourney time), but I figured if I'm touching on a bunch of schools out west it couldn't hurt to throw their names in the hat as well.